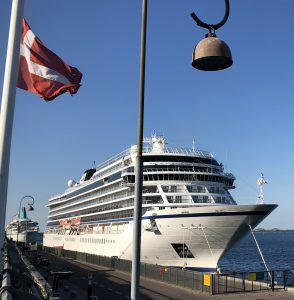 Welcome back to my Cruise Travel Blog – my first day on board Viking Sun! 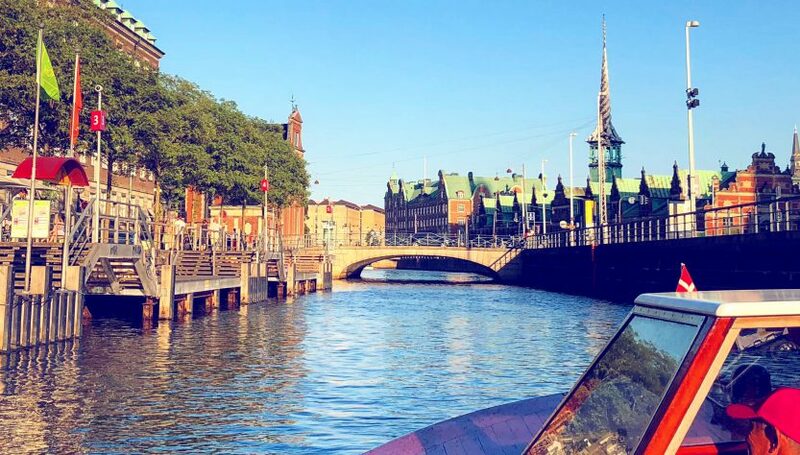 Setting an alarm for 4am for an early flight is never fun, but I can’t remember the last time I got out of bed so fast, ridiculously excited to be flying to Copenhagen to finally see Beven and experience my new ‘home’ – Viking Sun. Anyway, after being taken by bus to what felt like a different airport, we finally boarded the plane and a short 1 hour 50 minutes later, we landed in Copenhagen. We walked off the plane straight into the queue for Passport Control. Great! Unless you are like me who hates airplane toilets and needed to go, but now have to stand in a huge queue before being able to find one… About 30 minutes later, I’m through and following the signs for ‘Arrivals’ and ‘Baggage Reclaim’. I walk. And walk. And walk. OMG, how big is this place, how far is Baggage, and where are the damn toilets?! A few travalators later, I finally find a unisex bathroom and then also the baggage hall. Of course, my baggage belt had to be in the furthest part of the hall. I mean, let’s make this trip as long as possible, right? At least by the time i get there, my bag is already out, so I grab it and hike back to the start of the hall where the exit is. Signs for public transport are good, I follow straight out the main door to the ‘Taxi’ sign and into another big queue, of course. Fortunately, this queue moves quickly, there is no shortage of Taxis, and they all take credit cards and speak English which is very helpful. My Taxi driver was so lovely. He had worked in the IT industry until he was 60 when he got fired, so took up driving as he wasn’t ready to retire and has a big family to look after. He told me that his car was one week old and he absolutely loved it, and how much his English has improved since driving as he could speak to everyone in English. I observed that the river looked really clean, particularly having just come from London’s river Thames and he told me that locals actually bathe in it, it’s that clean. They will hang out at the rivers moreso than the beaches, as they stopped any major ships etc from entering the waterways many years ago to reduce the pollution. The drive to Langelinie (pronounced ‘Langalinia’) Cruise Port is about 30 minutes from the airport and it’s a really beautiful drive, past canals and brightly coloured buildings; lots of bikes everywhere and I caught a quick view of the stunning Amalienborg Palace. Enough of a view to know that I definitely wanted to come back to this city and explore further. The taxi got to the port where two ships were docked and asked which one I was boarding. I couldn’t see the names of either, but instantly recognised the beautiful new Viking Sun for her stunning white modern presence, over her more colourful and older-looking neighbour. I grabbed my bag and walked to security who checked their list, checked my passport and allowed me through. From here I walked to the gangway, spying Beven as I approached. 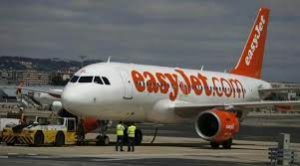 I was warmly greeted by the crew, my case was taken, my hand luggage scanned and within minutes I was on board at Guest Relations to get my key and be officially registered. In all my years of cruising, I’ve never boarded a ship so smoothly and quickly. Guest Relations is next to the main atrium on the ship – a truly beautiful area with an impressive matt-black Steinway piano at on the ground level, as you look up at the staircase to a huge screen, used for displaying historical facts during the day, and Munch artwork later in the day, which Viking Cruises has exclusive rights to. Key in hand, Beven took me through to our room to drop my bags, and then gave me a quick tour of the ship before sitting down for lunch in the cafe. 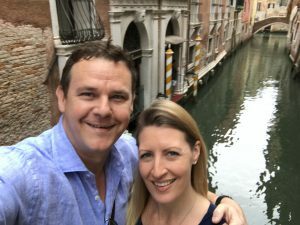 I’ll go through each part of the ship in a Viking Sun post rather than in this blog, so keep an eye out in the Cruise World section of this website. Mermaid’. I have to admit, she’s a little underwhelming, and ‘little’ is certainly the key word. 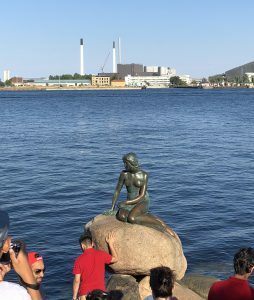 There were swarms of tourists all taking photos, people wading into the water to get that perfect snap, one guy even trying to climb up on to her… I have no idea why…we didn’t stay long! 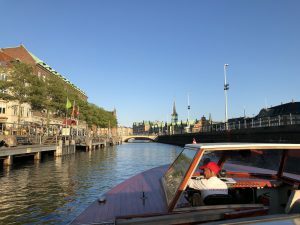 Beven told me he had a booked a surprise for me on my first night – which turned out to be a Jazz cruise along the waterways of Copenhagen! It was absolutely fabulous, with a wonderful jazz band who gave us stories of how the Charleston dresses came to be and the origins of other famous songs, encouraging guests to get up and dance in the aisle of the boat…all whilst cruising along narrow rivers and under very low bridges to admire the incredible architecture in this picturesque city. Oh, and I did I mention the Champagne? I love champagne! I was definitely in a happy place. The ship departed shortly after we returned from the jazz cruise and we just had time to grab a quick dinner before Beven needed to introduce this evening’s headline act, Kevin Devane, an English comedian. The theatre was busy and I love that they have blankets over many of the seats which is perfect for people like me who hates air conditioning and is always cold! From here we went to Torshavn (pronounced ‘Tors-haven), a beautiful cabaret style bar with cozy booths and a great band playing classics and requests. The Production Team often come here at the end of an evening to dance with guests and create a great vibe for the party animals of the cruise. It was also a great opportunity for me to meet everyone and I was made to feel so welcome and part of the Viking family, I couldn’t have asked for a better start to this amazing adventure!